Over one thousand five hundred men and women have benefitted from QAF's Qur'anic Arabic Course, a totally FREE nine month course designed and taught with modern methods by Dr Surty over the past twenty years. QAF in collaboration with IRF (Islamic Research Foundation), has produced a unique Qur'anic Arabic Course composed of seventy-seven half-hour episodes with visual aids, authored and presented by Dr. Surty. These episodes have been broadcast on satellite television in over one hundred and fifty countries of the world. 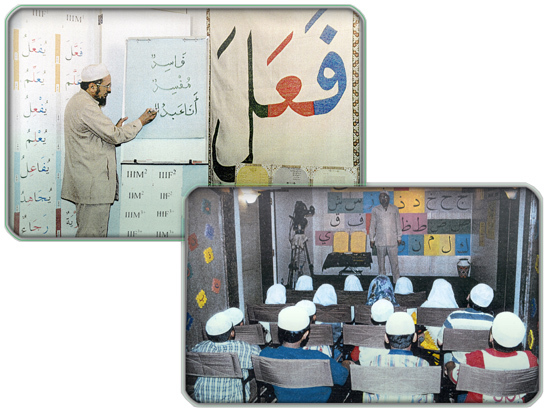 Two hundred and forty-six teachers have been trained voluntarily in Qur'anic Arabic through intensive teachers' training programs based on modern methods. The inaugural sessions of such courses at Aligarh Muslim Univeristy in India and the International Islamic University at Islamabad were chaired by their respective Vice-Chancellors. QAF has published books on the themes of Qur'anic Arabic, the Qur'an and distributed thousands of volumes on a non-profit making basis. Provided guidance to researchers on the Ulum al-Qur'an. Conducted courses on the Quranic script through modern methods. Cleared many doubts in the minds of Muslims here in the West created by the media concerning the Qur'an and the Sunnah by mutual peaceful discussions.